Whether youre just practicing your wet re-entry on your kayak or doing a real rescue miles from dry land, youll need a kayak bilge pump to get that water out of the cockpit or youll be paddling a submarine home. The Beckson Thirsty-Mate Kayak Bilge Pump is a fast way to empty all but the last few drops from your boat. The Thirsty-Mate's all plastic design is self lubricating, easy to clean and will not corrode. Tom has had one of these pumps for over 25 years and it's still going strong. 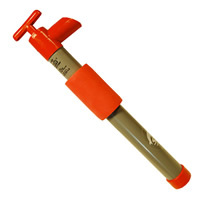 The Beckson Thirsy-Mate is 18" long, comes with a float and will pump 8 gallons / minute. From HenryC of New York, New York on 8/29/2017 .